Hello friends, Flipkart launches a referral programme yesterday. This Referral programme is for flipkart android app. They are giving Free RS 50 Flipkart vouchers for new app users. and for every successful referrer they are giving rs 50 flipkart voucher. In this way you can earn Maximum of Rs 2000. 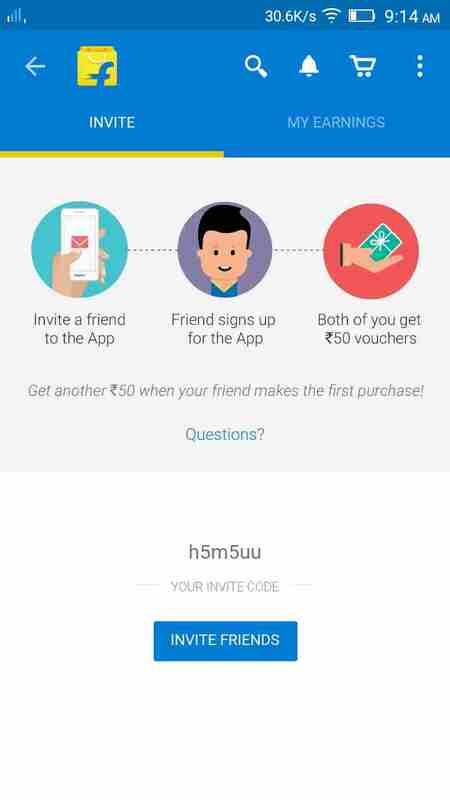 But you can only invite a maximum of 20 people, So you get Rs 1000 as Referral bonus and you get RS 50 from each invited person’s first purchase. We are on Techintor.com added unlimited trick for getting Rs 2000 easily. You can read flipkart unlimited flipkart voucher earning trick here. So guys don’t waste more time, start earning free flipkart vouchers through flipkart unlimited voucher loot trick. NOTE- FLIPKART INVITE AND EARN CAMPAIGN TOC CHANGED. NOW YOU CAN EARN RS 25 AFTER FIRST PURCHASE OF INVITED PERSON. 4. On the page you can see a option to apply code, there put below code to get rs 50 instantly. By above steps you can earn upto rs 2000 flipkart vouchers easily without actual inviting procedure. Terms & COnditions of the offer has changed..